Services - The Big Bee Search Ltd.
Partnering with the Big Bee Search is an experience of being cared about. Solving problems for you is what we focus on. We are recruitment consultants and not mere agents who go find people as though we are just taking an order. Before we take action, we strive to fully understand the current situation thoroughly and your ultimate goal. We listen to your pain, and analyze it. Wherever appropriate, we break down and simplify the problems for you. If there is an internal conflict regarding a hire, we offer to speak to your internal departments and hear them out, and explain the problems and the propositions. We believe that there is no problems that cannot be solved. Hiring for a position seems like a departmental issue, yet if not handled properly, often has rippling effects on the entire organisation. Our job is to get you and your colleagues to understand and agree on a solution before we go ahead with an action. Hiring for a position is fundamentally a very simple concept. There is no reason why one cannot hire the right person within a certain time frame. Unfortunately, some large corporations have layers of internal recruitment processes in place that can sometimes hinder the hiring process. What set out to be a well-intended cost –cutting mechanism can sometimes cost the business financial burden, such an example is when a company is behind schedule in hiring a experienced counsel and ends up spending more on external legal fees. The Big Bee Search understands and respects fully the importance of internal procedures. We wish not to bypass any major procedure in our approaches but to work alongside and together with your internal recruitment team to produce the best results for your business. To us, human resources is as important a function as the legal function. We wish to build long team partnerships with your internal recruitment team. Your career is priceless, as such we aim to listen to your needs and offer a solution aligned to your aspirations. We consult with candidates at all stages, advising at all times on what the best route is to get you to where you want to be in five to 10 years’ time. However, if you want an immediate solution, we work together to offer you an immediate solution. Treating candidates and clients equally and rendering them with the same level of importance is also one of our principles. We act as the unbiased middleman and make the best matches we can. If a platform is not right for what you are looking for, we will be honest with you and advise accordingly. Find you the right ‘home’ is our goal, whereas making a placement fee is the byproduct of this process. Our Key business streams mirror our clients, as such we assist both corporate clients and private practice clients. The diagram will give a an overall view of the various subgroups and specialities in which our team works in at the Big Bee Search.  This is by no means a full analysis of the legal market, we understand that this is a fluidic diagram that skill sets can and will cross sect various areas, as such we always take the uniqueness of the requirement with the utmost respect whether, this is from a client or a candidate.